Sometimes an event resembles epic entertainment more than a party or celebration. At NY Party Works, we’ve been in the event planning business since 1993 and we know that party entertainment can make or break your celebration. We also know that for certain corporate gatherings and events like weddings, bar and bat mitzvahs and Sweet Sixteen celebrations great entertainment is essential. NY Party Works has access to some of the most unforgettable party entertainment you can find. From DJs to Interactive Entertainment to Photo Booths, we have it all. And we can help take away your entertainment worries. We can even take all of your planning worries away with Total Event Planning. Let us know your budget and we’ll tell you what we can do for you. We’ll help you develop a theme and meet your goals for the event. 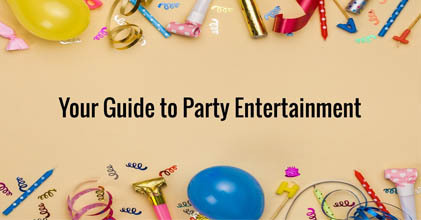 So we want to provide you with this guide to party entertainment. Eventbrite gives tips on booking entertainment for New Year’s Eve, but the advice is strong for other events as well. You should book your entertainment early and you need to factor in audience and ambiance when you make your plans. Think about it. The entertainment you would hire for a teen’s birthday would be different than you would want for a corporate event. But either way, if you’re planning an event of significance you can’t ignore the importance of music. NY Party Works knows how to get your guests out on the dance floor. We have relationships with top DJs MCs and Dancers who can provide live music for your party. We can even do karaoke. And NY Party Works also has an excellent place to enjoy a DJ or music from your devices. It’s our inflatable Lounge Dome and it’s the perfect place to relax and enjoy your music. Interactive Entertainment is an exciting way to keep your guests occupied. Virtual Reality or Team Building events are both entertaining and high energy. There are many different types of Virtual Reality to choose from that will immerse you in different worlds. Arcade games such as our hi-tech racing games will create some healthy competition. Not all party entertainment is musical. NY Party Works has unique entertainers who can perform on a stage and mingle with your guests. You can bring the big top to your event with our strolling Circus Performers. We’ve got jugglers, clowns, stilt walkers and tight-rope walkers. We have illusionists who can entertain you with simple slights of hand to dazzling performances. Another great performance from a different realm comes from our fortune tellers. Your guests will have loads fun learning their future. In addition to performances and music, some of our best party entertainment comes from some of our artists. From Airbrushed Tattoos for kids to Cigar Parties for grownups, we have something for everyone. Your guests can get a keepsake from our Caricaturist or our Fashion Illustrators. Kids can bring home fun decorations like Pipe Cleaner Art. No matter what type of event you’re planning, NY Party Works can help you find the perfect entertainment. We’re Long Island’s premier party and event planning company and we can help you find what’s right for your event and make your party epic. To learn more contact NY Party Works today.